You don't have to spend a lot of money on a sweater for your pet. 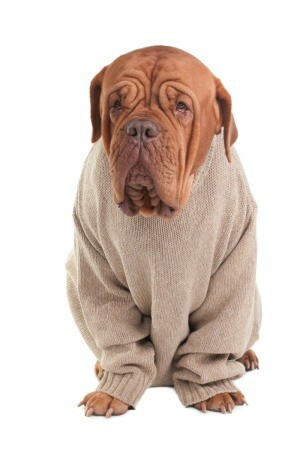 This is a guide about inexpensive dog sweaters. Is your doggy cold, but you just can't justify spending $25 on a "special" sweater? Go to your local GoodWill and pick up a toddler sweatshirt cut off the arms an inch down from the shoulder seam and "viola" you have a doggy sweatshirt. This will only cost $1.25. Not only will your doggy be warm and happy, but you will also be supporting a great service for our disabled community. WOW! This is a GREAT idea. I will definately do this. I may try one out of a little tee shirt as well as my little 'ball-of-fluff is going to be shaved for summer. I have an 8.5 pound toy poodle who is 17 years old. His wardrobe includes several preemie sized t and sweatshirts from Goodwill and the clearance rack at Walmart. If you want a knitted sweater, cut off the sleeves to the appropriate length, turn under a double hem and sew around the middle of the turnunder with a small running stitch, catching all layers. His turtleneck sweater is especially warm in our western NY winters. If the bottom of the garment is too wide or hangs down too far underneath the dog's belly, sew a running stitch with elastic thread around the bottom hem and gather it to a more comfortable length. Going to do this....for mine and my friends dogs!